Keep your backseat passengers entertained with at and t electronics universal car headrest mount (chm5). 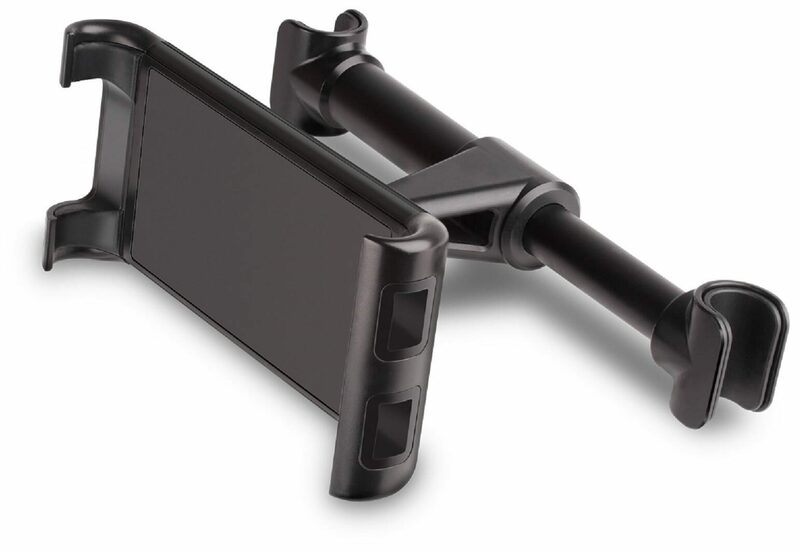 The chm5 is designed to hold your smartphone or tablet securely on your car's headrest and brings your devices up to eye-level for easy hands-free viewing. This car headrest mount is designed with expandable sides that will fit most current tablets and phones. This mount allows passengers in the backseat to enjoy movies and shows hands-free. It gives you the freedom to rotate your device in 360° which enables you to view your switch between portrait and landscape mode for ideal position/viewing angle. Convenient push mount allows for simple installation. Tablet removes easily yet reattaches to headrest securely for maximum in-vehicle convenience - children can also quickly learn how to mount and remove their tablet on their own.